Queen of England, married to Henry II, 1152-1189. She and Henry had 8 children, including Richard (the Lionheart) and John (of Magna Carta fame). Eleanor makes appearances in all three books of my Battle Scars series and was a joy to write. Here is a scene from Book II, For King and Country. Enjoy! Edric approached the queen, drew down to his knees, and kissed her outstretched hand. “Then it’s true?” Henry asked as Edric rose. Edric didn’t flinch. “God’s will be done.” He tipped his head, said goodnight to his sister, and departed, much to Henry’s relief. “More the king’s will,” Henry said in a low voice, which elicited another smile from the queen. The bride and groom left shortly after, headed to Cartholme. As other guests took their leave, Eleanor’s servants retrieved her chests from the wagons. Squires placed the knights’ pallets along the walls of the hall. Eleanor’s chamberlain set about making Henry’s bedchamber suitable for a queen. Pillows and tapestries, silver pots and candlesticks, rose scented candles, more dried rose petals on the floor, and a huge bearskin rug were put in place. “Three…? Stephan—he’ll accompany you?” Henry’s heart sped like a boat with the wind in its sails. He’d not seen Stephan since the night of the funeral, almost two months past. 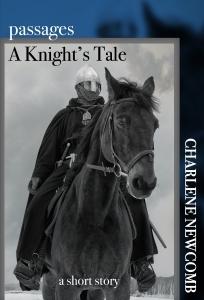 Charlene Newcomb is the author of the Battle Scars series, 12th century historical fiction filled with war, political intrigue, and a knightly romance of forbidden love set during the reign of Richard the Lionheart. She is currently working on Echoes of the Storm, a sci fi/space opera filled with rebels and traitors and battles and romance in a galaxy far, far away (no, not Star War). Sign up for Char’s Newsletter for exclusives and special offers.